"It's definitely spinning too fast to be natural, Sir," I sub-vocalised, "And the axis of spin is precisely aligned with its longest dimension." "Acknowledge that, Sub," came the laconic reply. "This just might be it, Sir," I added, adding with a tinge of reverential awe in my voice, "This might be the Last Asteroid." "Don't get your hopes up, Sub," the Skipper's voice rang in my ears again from the implanted bone-phones, "It’s probably just another false alarm." I said nothing, although I did have a certain hunch about this one. 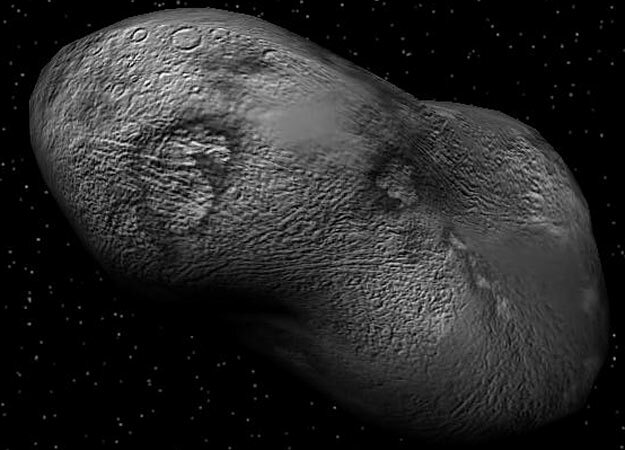 Human beings living in space need gravity and the only practical way to create the effect is by spinning a structure of some kind: a hollowed-out asteroid, for example. Artificial gravity consumes too much energy for long-term use; it takes a significant fraction of the power output of a ship's main reactor just to provide the inertia nullification required to make a warship’s acceleration survivable for the crew. I watched the image of the slowly approaching rock on the virtual screens projected onto my eyeballs and thought about the decade I had served in the Fleet. It had been a long war and now it was nearly over: indeed, some people had been saying that it had been nearly over for many years. After the battle at Himalia, which occurred just before I received my commission, the remnants of the Expansionist fleet had scattered, seeking to hide themselves amongst the detritus of the Solar System. We knew they still had considerable manufacturing capability; their capital ships are big and slow because they lug around with them everything they need to build more ships. So, we could not afford to allow them to regroup and re-arm. They had to be crushed, destroyed utterly, before they could establish a closed manufacturing cycle. The Solar System abounds with asteroids, iceballs, comets, planetoids and other wandering rocks. Some are in the region known as the Asteroid Belt; others are found orbiting between Jupiter and the outer planets. Yet others form the Kuiper Belt: large planetoids like Pluto and Charon on the outskirts of the inner Solar System, together with millions of much smaller bodies. And beyond that, the vast excess of the Oort Cloud, a shell of billions of objects and the source of most icy comets. There's a lot of living space out there, even though the Oort Cloud is too far away and still inaccessible to anything other than long-range robots. Besides, the Oort and Kuiper bodies are icy - not just water, but frozen methane and ammonia too. The ice is poor stuff as the starting-point for a manufacturing process; the automated manufactories would much prefer a diet of pulverised rocky or metallic asteroids. So, for the best part of a decade, our Consolidationalist fleet had been all over the system, carefully examining millions of asteroids. Which is why the Skipper and I had been spending days, even weeks, packed into acceleration suits and immersed in the interactive command and control environments of the kind once known as Virtual Reality, piloting our two-man heavy cruiser around our particular segment of the Belt. Actually, with a bit of luck, we wouldn't have to investigate every asteroid. We had a distinct edge: a bit of intelligence which told us exactly what we were looking for.